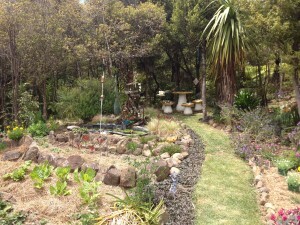 Gardens of Eden, Great Barrier Island…. I have been inspired this week by those pioneering women who take a piece of dry, cracked, wind blown earth and transform it into a lush organic garden that nourishes the environment and themselves. You see last weekend, a friend and I wrangled our husbands and another pal to do the Great Barrier Island Garden Tour, a delightful event held annually on breaktaking Great Barrier Island NZ where we have a holiday place. While a garden tour sounds a yawn suitable only for geriatrics, this particular event is more of an inspirational adventure into the unknown than your standard “garden variety” garden tour. And it had the added bonus of allowing us to be amongst the younger end of the group. While I have been bursting with pride over my urban edible balcony, in the parallel universe of Great Barrier Island the residents are a tad more ambitious, creating hidden sanctuaries with no road access, Balinese inspired havens, private bush walks to frame the mighty kauri tree, and all sorts of other intrepid earthly endeavours. Even for us beach house owners, this island keeps revealing itself and continues to surprise. Around 120 of us were split into four magical mystery tours visiting various residents who have chosen to live remotely and off the grid. Our group dropped in on a passionate woman in her 50′s, whose life changed a few years ago when she attended a simple perma culture course. This culminated in her transforming an otherwise ordinary section into her magical “food forest” the soil for which is built up with local seaweed and rotting weeds and mulched and composted by her healthy free ranging chickens. Another gardener, a local business owner, remains true to her hippie roots by literally living in a clearing in the middle of the bush. Her unique hobbiton-style project is a progressive concept, meandering all around a series of well maintained shacks and sheds and featuring a mad variety of mismatched sculptures and whimsical what nots. We had lunch on the mushrooms pictured – I could have sworn Peter Jackson was filming nearby. An artist couple showed us how they’ve lived off their land for 30 years, and through much of this time bringing in their supplies on foot or by flying fox. Another couple have elevated their perfectly manicured gardens to minimize the damage caused by the annual flood that seem to sweep through their property. Each one of these residents started with a piece of seemingly infertile and unworkable clay. We all make choices on how we earn our living and for those who grow their own veggies, collect their own compost, mulch their soil to grow their own food, gather eggs from their free ranging hens, harvest food from the ocean , occasionally shooting the odd pig for a dose of protein, there is an enormous amount of satisfaction from just being so present to nature. So here’s to those modern day pioneers who literally do break in new ground with passion and commitment to create something that feeds the earth, their families and their souls.